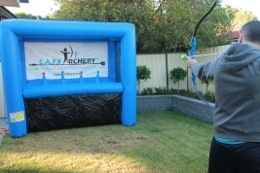 The Hoverball Range is a great way to experience archery in any environment. 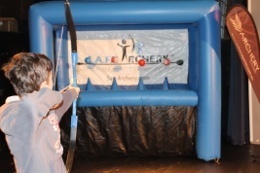 Players take turns to fire the foam-tipped arrows at 4 hovering balls inside the inflated archery range. 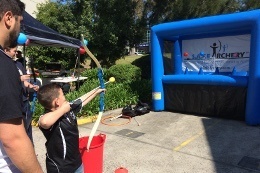 No prior archery experience is needed, our staff will teach players and allow for lots of practice so you can hit all 4 balls down! The soft foam-tipped arrows offer the same flight characteristics as a standard arrow yet are much safer, allowing opportunities to shoot outdoors or indoors without special netting! This makes it great for any event and from ages 6 and up! 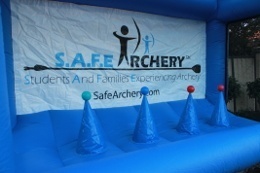 Don't forget to read the rules of Archery Tag before your event so you can hit the ground running and shooting! Download your free copy of the S.A.F.E. Archery Information Pack!